When you apply a formula in Excel it may return an error. 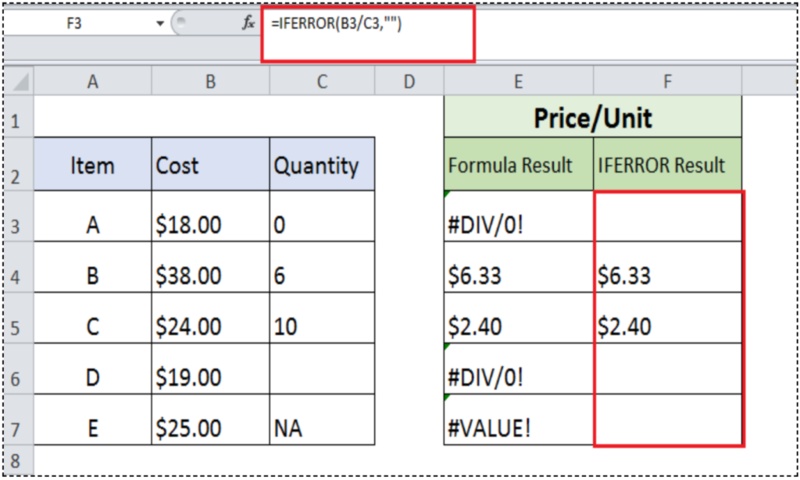 Excel formulas return various error types due to a variety of reasons. You can use the IFERROR function to manage what happens when a mistake occurs. When you don’t want to show these returning errors as result of a formula in your data then Excel has a way to return an alternate value or custom value or blank cell. For this purpose IFERROR function is used to manage such errors. 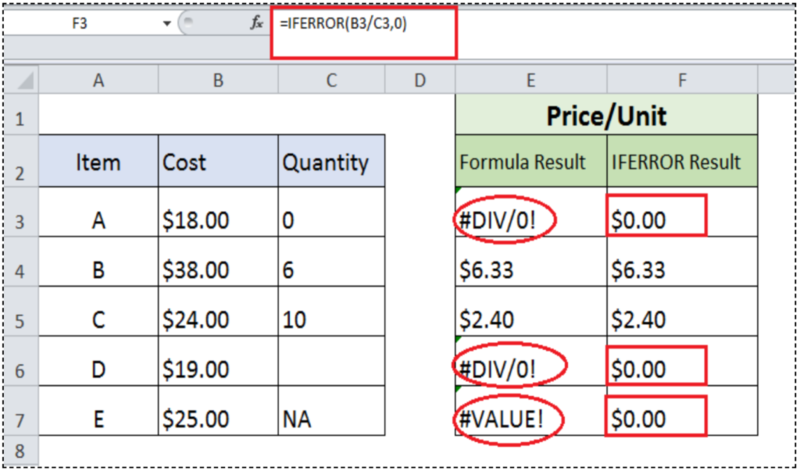 By definition, Excel IFERROR function returns an alternate value if formula returns an error. It is categorized as a Logical function and it handles all types of errors including #N/A, #VALUE, #DIV/0, #REF!, #NUM!, #NULL or #NAME?. Value argument is what to check. It can be a formula, calculation, an expression, a value, or cell reference. 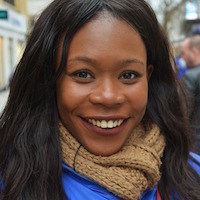 When you apply the formula in this syntax, Excel checks and runs the value argument first and returns the resulting value of formula or calculation. If value argument returns an error then Excel returns or performs calculation supplied in value_if_error argument. In this article, you will learn how to use IFERROR function in some basic and advance formula examples. This function is widely used to check and manage errors returned in functions and formulas like VLOOKUP, INDEX, and MATCH in Excel. It can be used to manage errors, ranging from basic calculations to array formulas and nested formulas to perform sequential value lookups. It is very handy to use and easy to manage. Copy down this formula in column D to other rows. 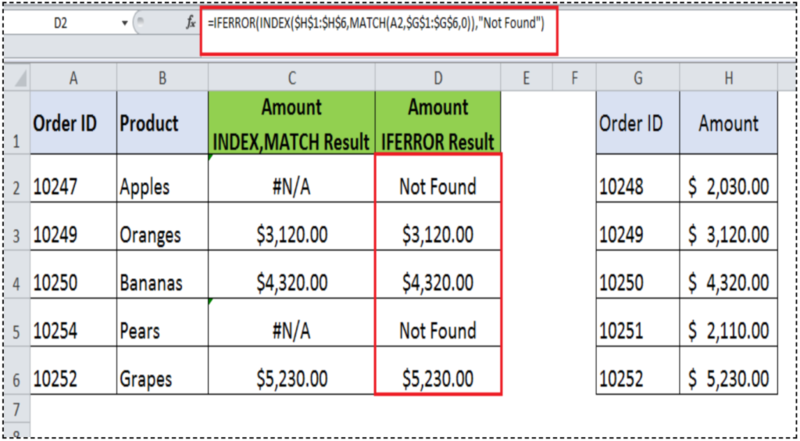 If you want to look up for a value from a table using INDEX and MATCH function, it may return an error value if a value is not found in a table, same as in VLOOKUP case above. You can handle error value by using IFERROR function with INDEX and MATCH function together. If you need to perform a value lookup from multiple tables at the same time then IFERROR function is the ideal function to perform this activity. You need to combine two or more IFERROR functions together to lookup for a value from two or more tables at the same time. 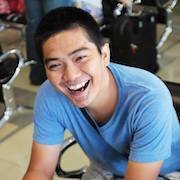 In last IFERROR function, you need to supply alternate value to handle error message in the value_if_error argument if there is no match found. 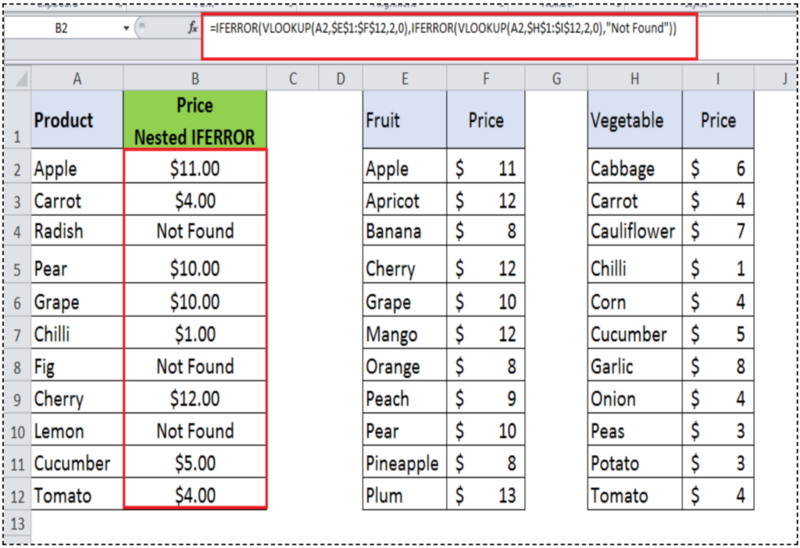 For example, you have two separate tables containing price list of Fruits (E1:F12) and Vegetables (H1:I12) as shown below, and you need to sequentially lookup for a value in both tables to return its price if that value is found in any of two tables. And if a value is not found in any of both tables, then return value “Not Found”. 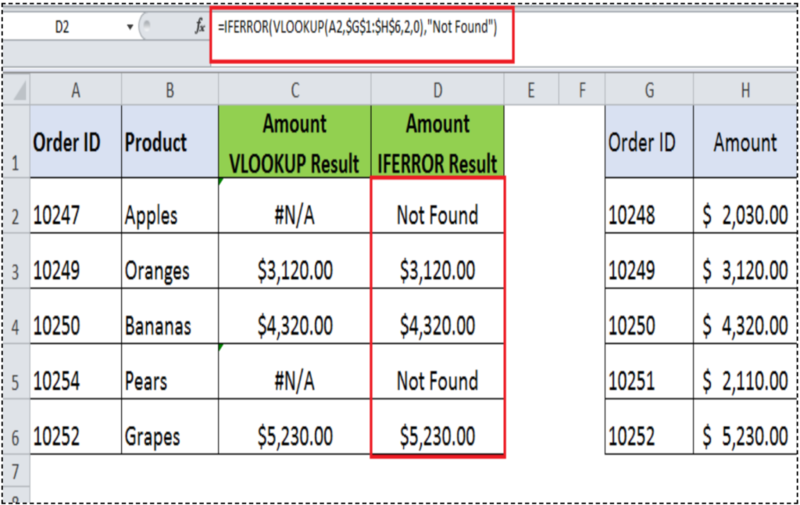 In cell Q3, nest the existing VLOOKUP function in an IFERROR function. If the VLOOKUP function returns an error result, the text Invalid Staff ID should be displayed by the formula. I need to use a IF function with a IFERROR(VLOOKUP function across multiple workbooks.